April 28th is Workers’ Memorial Day. 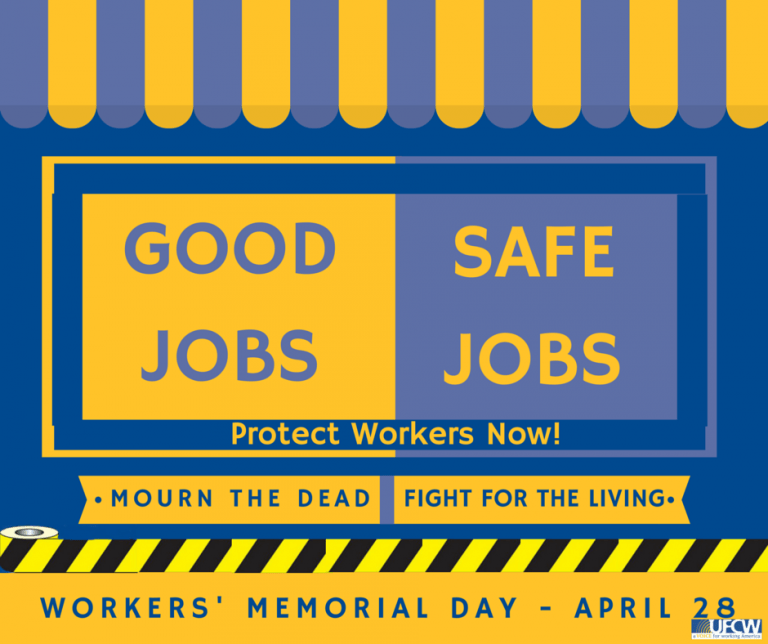 UFCW joins workers in the U.S. and around the world to honor the thousands of workers who have been killed on the job and the millions of workers who have suffered from injuries, sickness or diseases in their places of work. While decades of struggle by workers and their unions have resulted in significant improvements in working conditions, too many workers here in the U.S. and around the world are suffering or dying on the job. -Over 4,600 workers lost their lives on the job in 2014 alone. -Millions of America’s workers continue to suffer from injuries and illnesses at work. -Women, older workers, as well as temporary and foreign-born workers are especially at-risk. New standards must be enforced to keep pace with a rapidly changing economy that is pushing more and more workers into precarious and unregulated jobs with little to no workplace safety protections.